Making a lactation cookie of my own has been on my to do list for a while now. But, with buying a house and moving and now catching back up with our stores, I finally had to make time to get these cookies made. You see, I woke up the other morning at around 3 am with a stabbing toothache. It prompted me to make a dental appointment only to learn I need to have my wisdom teeth taken out. I knew it would happen sooner or later as it does with most people but this really isn’t the greatest timing. I haven’t pumped a single ounce ahead of time and since I’ll be sedated during the surgery, I have to pump enough milk ahead of time for someone else to feed Kaliah for the 12 hour or so period of time that the sedative is in my system. With a trip to the west coast planned for the first weekend in August, this has to happen quick so I can heal to some degree and not be totally miserable on our trip (or worse, loopy from medication). In an effort to boost my supply a little quicker so I can get my dental work done sooner, I whipped up this yummy lactation cookie recipe. Combine the flax seed and water in a small bowl and set aside for 3-5 minutes. Cream butter, sugar and molasses together. In separate bowl, sift together flour, salt and baking soda. Open 12 fenugreek capsules into the mixture and sift together. Add dry mix to the wet sugar mixture. Mix . Add in oats and mix. Add in chocolate chips and pumpkin seeds. Bonus Options::If you want a cookie that will do double duty to boost your milk supply, add in 3 Tablespoons of Brewer’s Yeast. Bake for 10 minutes and let cool on a wire rack. So what about these helps your milk supply? Well, after eating these the first night I made them, I woke up with completely full feeling. I nursed my hungry baby on both sides and still pumped 8 ounces! If you try out our recipe, please let us know how they work out for you! Just when I thought I had mastered the art of cloth diapering my little girl, I decide to cloth diaper our second little girl from birth. When I made the decision to use cloth on Natalia she was already 9 months old. It was a decision made in an effort to save money and because I was so tired of messy poop explosions, nasty little gel blobs left on her skin from the disposables, and having a portion of the box of disposables be defective with tabs ripped off or something. Even after a year and a half, there were still corners of the cloth diaper world I had yet to venture to but cloth diapering a newborn has exposed me to a few of those uncharted territories. 16 Fitted diapers with hidden fleece –Made myself from my cloth diaper pattern & tutorial. Is it really so hard to believe that I’d never used prefolds before? For someone who chose cloth to save money, it probably is a little odd that I didn’t use prefolds since they are such an affordable option. You have a few different options for different types of newborn prefolds which include Indian or Chinese cotton, bamboo, and hemp. I have just over a dozen plush, newborn cotton prefolds. Admittedly, the idea of different folds scares me a little and I knew that if I wanted to make things as easy as possible on my hubby that we would just go the route of a pad fold. Basically you just tri-fold the prefold and then lay it in a cover. I did actually get a free set of diaper pins but I was so worried that I would poke my baby girl so I actually only tried to use them and do a real “fold” maybe twice. You can also pick up a pack of snappis for pretty cheap and use those in place of the pins. They’re a safer alternative that don’t run the risk of poking your baby yet still manages to grip the prefold well enough to keep it snug. You can get prefolds from Diaper Junction starting at only $1.00 each. *At 10 weeks, Kaliah is weighing 10 1/2 pounds and we are still using the prefolds full time with her covers. I used the newborn Rocket Bottoms pattern to make my own fitted cloth diapers. These have a cotton outer fabric, hidden fleece layer to repel moisture and a soft cotton velour inner fabric. Since I had limited covers, I could get more uses out of them by using the fitted diapers since they had their own elastic around the legs to hold in those runny poops that newborns have. Fitteds are made to act as absorbency and usually to be used with a cover. With these, I was able to get a fit that contained the mess, yet could still absorb an incredible amount of pee. 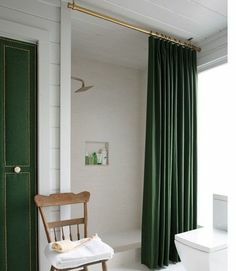 Believe it or not, I make this exact style of diaper for my toddler and the fleece is enough to make it leak proof for 6-8 hours if necessary without a cover, yet I found that I needed them for the baby. Just an added note, but I also chose to make these in the style of an AI2 (All-in-two). This way I can still get the added absorbency of the snap in inserts but they don’t take forever to dry after washing since they aren’t all one thick piece. *To give you an idea, This photo was taken at 10 days old to show the fit. Kaliah is 10 weeks now and 10 1/2 pounds and we are outgrowing diapers made from the Rocket Bottoms pattern this week. She can still fit on the very last snap setting but the leg elastic is getting too tight. How is it that I had never used covers before our second baby? I know, take me out back and shoot me now, right? All that really matters is that I’ve been introduced to them now and they will forever have a place in our stash, no matter the size. Our newborn stash has 2 Thirsties Duo size 1 covers and a Rumparooz newborn cover. I also have a one-size Best Bottoms cover from Nicki’s Diapers. Once I had gotten the other 3 covers, I realized how handy they were and actually decided to make this diaper for the baby rather than the toddler. You can see how it fits on our baby in this photo. This cover will be around for quite a while, I mean, it even fits my 2 1/2 year old with plenty of room for her to grow. Learning the ins and outs of cloth diapering my baby from birth was definitely a good experience. My poor baby got a really bad cough at about 6 weeks and was on antibiotics for a week and in disposables. She had so many little blowouts and there were even a couple times where the cheap tabs would get caught on the inside of her clothes at night and pull off. That made for a fun morning. In contrast we have not had one single blowout from any opening in our cloth. She has had some really bad poops and although it may have been in every little fold of skin that her diaper was covering, it didn’t seep out at all. Have you cloth diapered from birth? It’s true, I’ve become one of…them. The moment I considered cloth diapers I joked around about how crunchy granola I was becoming but I never in a million years thought I would even give a second thought to consuming my placenta. Before you click away in a hurry thinking I’ve gone bonkers, hear me out. Placentas have been used in traditional Chinese medicine since the 1500s. It’s even become customary for the placenta to be prepared for the new mother in Italian, Vietnamese, Chinese and Hungarian cultures. So aside from the fact that it’s been done for hundreds (if not longer) of years, what would even make the placenta appealing to consume? First off, the placenta is packed full of rich nutrients. After all, it sustains the life of your baby in utero. It can help balance postpartum hormone levels. Helps the uterus get back to its pre-pregnancy state. Reduces healing time and postpartum bleeding. Helps to replenish iron levels to avoid an iron deficiency. I’ve also heard from other ladies that the placenta pills can help with postpartum depression, or baby blues, which would make sense given that low iron levels can contribute to mood change and depression. Although you can choose to have someone encapsulate it for you, there are methods to process and do it yourself. Generally, you will see diy methods that include using things like a steamer and dehydrator. Well, I couldn’t get my hands on them and after doing some research, came up with a few tweaks to still get the job done using materials we already had on hand. Talk with your hospital or birthing center about their policies concerning the placenta. Some places will hold it for you until you are discharged and some will allow you to keep it only if you provide a cooler and a way to get it home and refrigerated within 24 hours. The first thing you’ll want to do is thoroughly rinse the placenta..then rinse it again. You want to pay extra attention to getting out every bit of blood and clots that you can. Gently massage the placenta as well as the “tree of life” veins around where the cord attaches to the placenta. Once you get it rinsed thoroughly, remove the amniotic sac and umbilical cord. Because we started the process at night, I then stored it in the refrigerator overnight in an airtight container with just enough water to cover the placenta. In the morning I removed the placenta from the container and once again rinsed with warm water. At this point you want to steam the placenta. I don’t have a steamer basket because I’m still young and broke and we’ve managed to eat well while cooking foods using other methods. Instead, I took a tin pie pan and poked holes in the bottom of it. I then wadded up 3 balls of tin foil to approximately the same size. Arrange the balls of foil a saucepan large enough to fit the pie tin, arrange tin on top and put in placenta. If you want to avoid your house taking on an odd aroma, you can slice some lemons and add a cinnamon stick or two in the faux steamer basket with placenta. Steam for 20 minutes and after turning placenta, steam on other side for 20 minutes. Once you have finished steaming the placenta, let it cool and rest. I really didn’t smell anything other than the lemon and cinnamon which was more of a light but fragrant holiday scent. Although, if you really want to know what to expect, it smells just like cooking any other organ you might prepare for dinner–liver, heart, etc. Slice the cooked placenta into thin strips. The thinner the strips, the quicker and easier it will dehydrate. Place on a foil lined cookie sheet. You could also use a dehydrator at this stage, but we didn’t have one so I decided to just process it in the oven. Cook for 4 hours at 200 degrees F.
Once the strips are completely dried, grind using either a spice grinder, food processor, or something similar that will grind it into a powder. At this point you could put the powder into a jar and incorporate it into smoothies or something but honestly, the thought of consuming it in a way more primal than capsules did gross me out a bit. I was lucky enough to be able to borrow a capsule pill maker thing from my in-laws. It made it fool proof to make the pills and was a pretty quick process. I just had to take apart the capsules, place the ends in each part then fill, close and place in a jar for using as I need them. Placenta capsules should be stored in the refrigerator while you are taking them. Keep capsules dry. Store any remaining capsules in the freezer for long-term use. Placenta capsules will last at least 1 year if stored properly and possibly longer. So, have you ever consumed your placenta, do you know someone who has, or is it something you would even consider? You know those lazy days you spend just lounging around your house? Well, although we’re not usually lounging at home, we do have a nice amount of downtime since we run our businesses from home. Pair that with an anxious toddler and you’ve got the perfect mixture for a tantrum unless you can find a way to keep them entertained. I especially love when I get a random strike of genius for a fun toddler approved activity. In this case, my hubby and I spent absolutely no money and about an hour of our time to create something Natalia could keep entertained with for a solid 2 months. Before you begin making your own light tunnel, you’ll need to gather a few things. 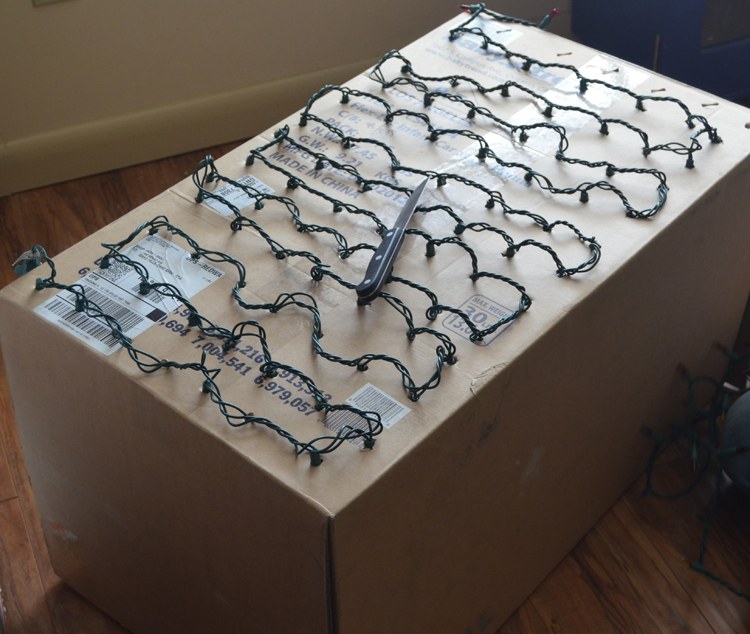 -A large box. We actually used the box that the baby’s car seat was -packaged in. Open the top and bottom to create a “tunnel”. -A knife or screwdriver for punching holes in the box. -A strand of Christmas lights. Using the knife or screwdriver, make holes in one side of the box. You can choose to do a completely random design or have them be even spaced in lines. 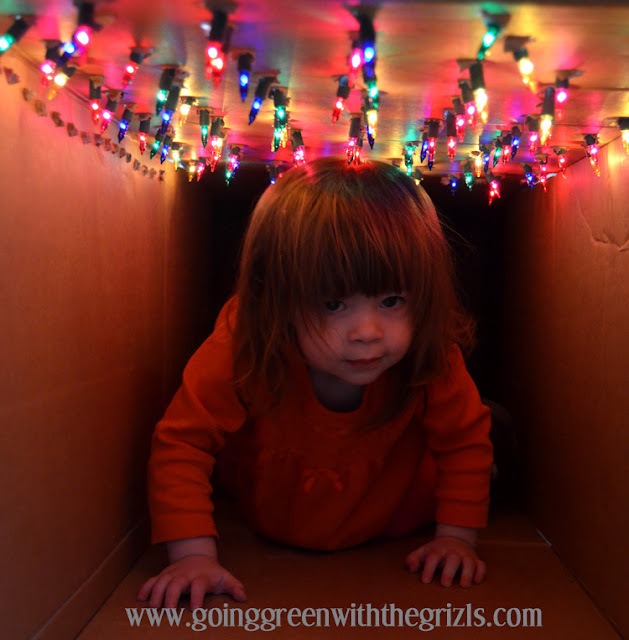 We chose lines just because I figured it would be easier to navigate the strand of lights that way. Once you have all the holes you want, simply stuff the bulbs of the lights into each hole.Okay, okay. You’re probably thinking this doesn’t look like much, right? To a 2 year old, it’s a thing of absolute magic. Of course, we didn’t stop at just the tunnel. 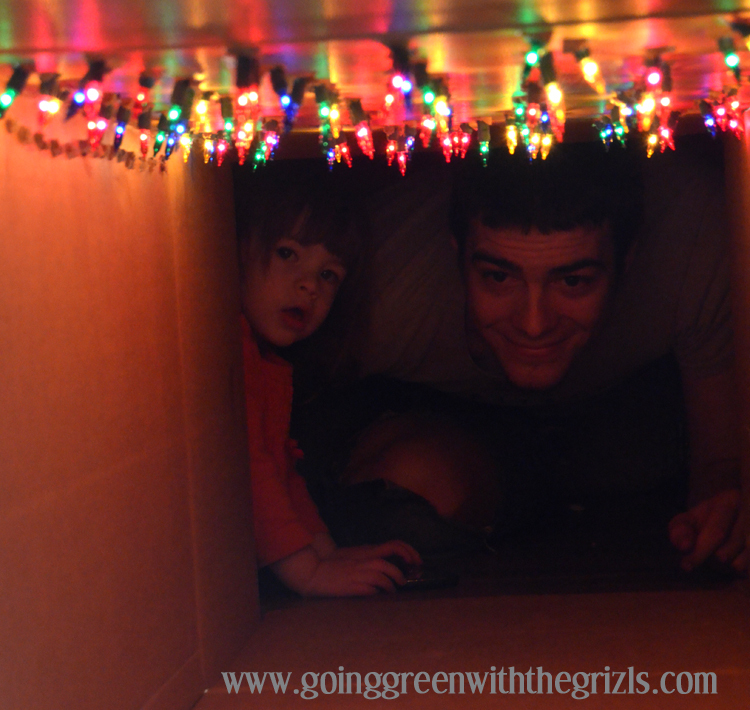 The tunnel was added to an existing homemade playhouse that Jake also made from boxes. 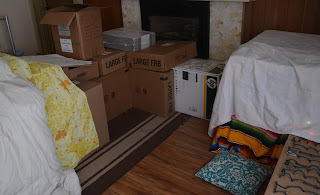 We happened to get our post office order in the next day which consists of boxes and boxes of envelopes, boxes, and other packaging material. You can see the larger “play house-like” section on the right side of this photo. You can also see where the tunnel was added. 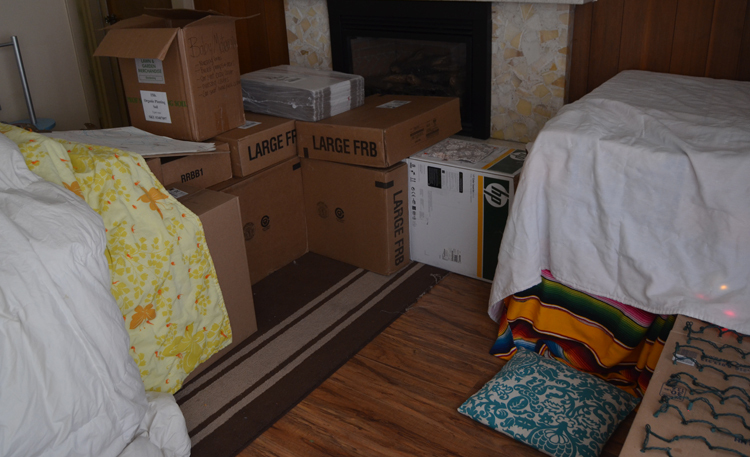 Jake then took the boxes (of boxes) and created a maze from the other entrance of the playhouse. It spanned our entire living room.